Ever wonder what bra will work best for you? Ultimately it takes getting properly fitted and trying on a handful of bras to find what feels best to you. Still looking for some more advice? Don't worry the ladies of Fleet Feet Orlando have got you covered. We put in the field work to review the bras to give you our opinion on their FIT and feel. The best-selling bra from moving comfort is unparalleled in comfort and support that works for nearly any body type. “Very Comfortable! Soft feel and supportive all at the same time. I can wear this bra all day without it being too restrictive. I feel like I can wear it all day but then go for a run and still feel supported” - Jenn Y. “Easy to get on. Love the adjustable straps. It doesn’t feel as controlled when it comes to bounce as well as others, but is very versatile and will work well for all types of women. Overall it’s a comfortable bra with minimal adjustment areas.” - Jess C.
“Easy to get on and off. It’s comfortable, but for me it doesn’t feel quite as supportive as some of the other moving comfort styles.” - Lauren L.
A dependable v-neck pullover bra that is loved for it’s uncompromising support and flattering shape. The bra is a single piece bra that does not have adjustments in the straps or the band. “One of my favorites. No clasps or strap adjustments. Very minimal - slip it on and slip it off. Nice padding but not too much. Also has a nice breathable back and can fit a variety of shoulder sizes.” - Jess C.
“The vixen was one of my very first Moving Comfort Bras and I think it’s a great introduction into wearing a high-impact support bra. I like how easy it fits without having to make any adjustments. I also think it works great in the hot summer months when you just want to wear a sports bra, it’s cute and functional!” - Kelley L.
The most supportive open back bra from Moving Comfort that is easy to get on and off. If you are between sizes you might need to go up one cup size. This bra is a part of the control collection offering a fully loaded experience. Adjustable, soft-padded back closure for proper fit and support. “For me this is my least favorite bra, but I am still working to find the right fit with this bra. I think this bra will work better for a fuller bust.” - Jess C.
“Super easy to get on/off. Great support without feeling restrictive. I like that it’s nice and light but also felt breathable. I would describe the Jubralee as a better fitting Fiona.” - Lauren L.
“Overall this bra feels snug, supportive, structured and feels really good on the breasts. This bra feels like it has really great support while still feeling lightweight. I would definitely wear this for a full marathon without concerns of chafing. I like that it’s still light, but it has some modesty control that I prefer in a bra.” - Jenn Y. Serious support is the result of this racerback’s arsenal of features packaged into a well-ventilated design. 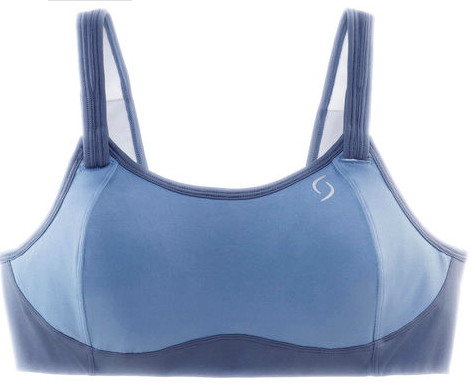 “I started running with this bra last month and I’ve really liked it. Although it is a little tricky to get on and off, once it’s on it’s very supportive and comfy. It feels light on, but still structured. It’s a cute style and looks good under a shirt too.” - Lauren L.
“Overall, this bra is just comfortable and supportive. I love that it isn’t too difficult to get on and off and doesn’t feel restricting anywhere. I like the material because it feels nice against the skin, but it is also supportive.” - Abbey M.
“Another favorite! I like the racerback support, adjustable straps, and clasps. This bra fits true to size and the material is all around comfortable. I like that there’s very minimal bounce but it just feels supportive. This bra comes in a variety of color options which is a plus in my book!” - Jess C.
The racerback powerhouse of the Moving Comfort line that has it all - the ultimate in support, shape, and customizable fit. Interior uncap design gives shape, support, and complete modesty. Interior front yoke prevents vertical breast movement. DryLayer® power mesh zones on the back offers increased ventilation. "Runs true to size. Overall comfortable. I feel like I can move freely in it but feel stable. I like the adjustable straps, clasps, and racerback for extra support." - Jess C.
"I personally don't like the padding in this bra, but it feels super supportive." - Lauren L.
Convertible back straps offer style and versatility that delivers 2 great looks that pairs great with any top. Contoured cups enhance shape, support, and provide complete modesty. Front DryLayer® powermesh zone provides extra ventilation while performing any activity.